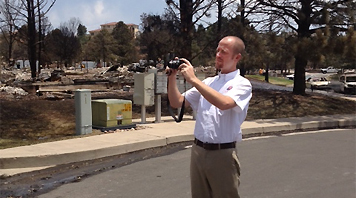 June 5, 2014 – The Black Forest community in El Paso County has spent the past year working through the recovery process in the aftermath of Colorado's most devastating wildfire in terms of structures lost. RMIIA has updated insurance damage estimates from the Black Forest Fire, and the insured losses are now estimated at $420.5 million resulting from approximately 4,173 auto and homeowners claims. That is about a $128 million dollar increase from the preliminary damage estimate of $292.8 million—estimated in the initial weeks after the fire—and still ranks the Black Forest Fire as the state's second most costly wildfire. The Waldo Canyon Fire in Colorado Springs is the state's most expensive wildfire with $460.3 million (in 2013 dollars) insured losses resulting from 6,648 auto and homeowners insurance claims. El Paso County reported 488 structures burned in the June 2013 Black Forest blaze, whereas 347 homes were reported burned in the Waldo Canyon Fire. The Waldo Canyon Fire for now remains Colorado's most expensive wildfire. Wildfire insurance costs hinge on a number of factors, including the number of primary residences in the area (as compared to vacation homes and cabins), the cost to repair/rebuild, and the amount of insurance coverage on the properties. The number of claims filed—ranging from smoke or partial damage to destroyed vehicles and homes—in the Waldo Canyon Fire (6,648) is also considerably higher compared to the Black Forest Fire (4,173). "Wildfire continues to exact a tragic and financial toll on our state," says Carole Walker, Executive Director of the Rocky Mountain Insurance Information Association. "But insurance catastrophe adjusters were on the ground since the first Black Forest evacuation notice, and insurers have spent the past year helping impacted residents recover and communities rebuild." Insurance is something most people don't even want to think about until they need it the most. But, understanding what is and isn't covered in your homeowners insurance policy can mean the difference of being able to rebuild your home and replace your personal belongings. Homeowners need to do annual insurance policy "check ups" to make sure they keep up with local building costs and have adjusted their coverage to include home remodeling and additions. If you don't have replacement coverage, consider spending a few extra dollars for coverage that helps pay for the cost of replacing the damaged property without deduction for depreciation. Ask about endorsements for "ordinance & law" coverage to help keep up with costs of new building codes and ordinance changes. Consider purchasing a separate flood insurance policy since flooding is excluded from all standard homeowners and renters policies.